María De Los Angeles Torres, a professor at the University of Illinois at Chicago, and Ana Carbonell, managing partner of The Factor, Inc., a Miami-based political consulting firm, gathered in an event earlier this month co-hosted by the Center for Latin American Studies and the Institute of Politics. 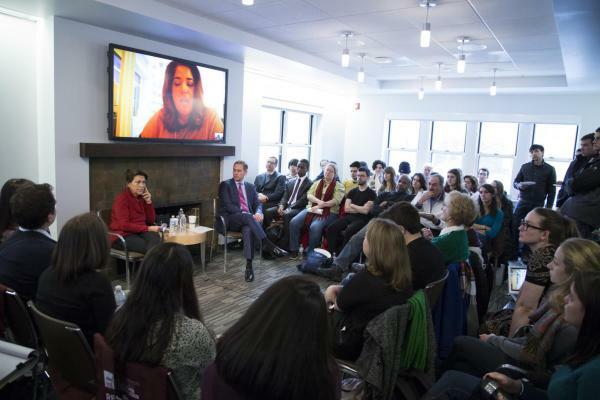 They debated the contention that has kept Republicans and Democrats busy over the past few months: whether the United States should lift its embargo on Cuba and normalize relations with the country. The two guests, one in person and one over Skype, disagreed on most questions posed, which is, perhaps, representative of a national conversation. But, encouragingly, national opinion generally supports improving US-Cuba relations, and an opinion poll in Florida demonstrates even higher levels of support. In Cuba, a fifth of the work force is private sector, citizens have unprecedented access to the Internet. All are encouraging signs that Cuba itself seeks normalized diplomatic relations. Torres challenged logics of the embargo and leveled many of the same points used by President Obama—among them, that after 50 years, America has little to show for isolating the Cuban people. She argued that a minuscule number of diplomatic points have been conceded, relations are, as always, chilly, and few things have changed politically. This last point is important—after all, the purpose of the embargo was to topple to the Castro regime, an objective that has not come close to fruition. Most of Latin America seems to have noticed the manifest failure of the embargo and taken actions to normalize relations with Cuba long ago, a fact that has put America at diplomatic odds with those countries. But, Carbonell pointed out, we should not usurp the Cuban people’s rights to self-determination. While this line of reasoning seems at odds with the embargo’s original goal—ridding the Cuban people of an undemocratic regime—Carbonell insisted that until all political prisoners are freed, Cubans are guaranteed the right to free association, and internationally-supervised elections are held, lifting the embargo would be unprincipled and unproductive. If borders were opened suddenly, Cuba could become a ‘capitalist-dictatorship’ cocktail like China or Vietnam, which would be, Carbonell claims, a very bad thing. It would not be difficult to leave the event with the impression that this discussion was not really about Cuba. Those who support Obama cheered his latest actions and those who do not said he was “coddling a dictator.” This discussion took place between a Republican strategist and Chicago academic at the Institute of Politics—without knowing any further background, most could guess before the event with which side each speaker would align. But what will happen in the future in Washington, Havana, and Miami, is much harder to guess. With the many developments sure to come in the next few months and years, it will certainly be not only interesting to watch, but also important to stay informed.